Celebrity chef Nobu Matsuhisa’s first Nobu restaurant in the Four Seasons portfolio. : Celebrity chef Nobuyuki "Nobu" Matsuhisa’s first Nobu restaurant in the Four Seasons portfolio is located in the Four Seasons Resort Lana'i. 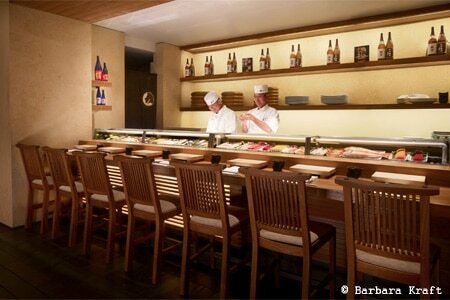 Nobu Lanai features Nobu's signature Japanese cuisine and also new dishes incorporating local ingredients. Expect Kona Kampachi with a yuzu miso and jalapeño salsa, and local opakapaka (Hawaiian pink snapper) tempura with amazu ponzu. Specialty cocktails include the Matsuhisa martini with ginger and cucumbers; and a Peruvian caipirinha with pisco, fresh lime, shiso and ginger beer. In addition, Nobu Lanai exclusively serves Hokusetsu saké from Sado Island off the coast of the Niigata prefecture in Japan.